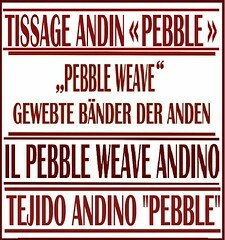 As March rolls to a close, so ends the first month for my e-book Andean Pebble Weave in its new home at Patternfish along with its German companion Pebble Weave – Gewebte Bänder der Anden. I want to once again thank Syne Mitchell of WeaveZine, Julia Grunau of Patternfish and all my new customers who have made this transition to the new home so smooth and successful. I have had a few things going on the loom this week…mostly bits and pieces that I will take along traveling with me…. gifts and such things. I wanted to free up all my loom bars and have everything in order before the trip and, in doing so, unearthed one more old project that was lurking in the closet. 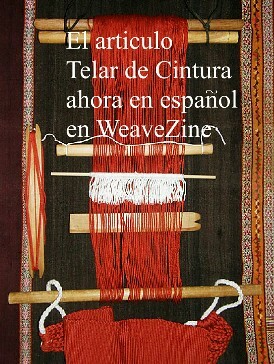 This was to try out a Mapuche double weave motif that is in the Taranto book. I wove it in two-weft double weave so that only the central section with the design is in double weave. I really couldn’t see myself finishing it and so off it came. As the beige sides are just regular warp-faced plain weave, they folded very neatly and easily along the edge of the double weave section and I was able to just sew a join. Now the MP3 player has a fancy home. I’ll braid a cord for it. Hmm, might even do one for the player itself. Now I don’t feel so bad about pulling this off the loom. Then I was prompted to do a little further exploration in supplementary-warp bands, you know that technique that I have never been too excited about. I learned it in two places in Peru and in another in Ecuador but never quite took to it. Well, I have to tell you that I am loving it now! First I tried a Sami pattern (in non-traditional colors and border in 24 wpi crochet cotton) and then dug out my handout from a Robyn Spady class and used her chart for a Celtic design (in tencel) and now I have reproduced a design from one of the Russian Old Believer belts that I photographed last year. There it is in the center. This was a width sample with some 3/2 weaving thread that I hadn’t used before. The ground warp and weft is 35 wpi crochet cotton. When I do the “real” band, now that I have established the width, I will warp an edge of off-white so the weft won’t be seen as it is above. As it so often seems to happen, just as I was thinking about the Russian Old Believer bands, I got a comment on my blog from a visitor. 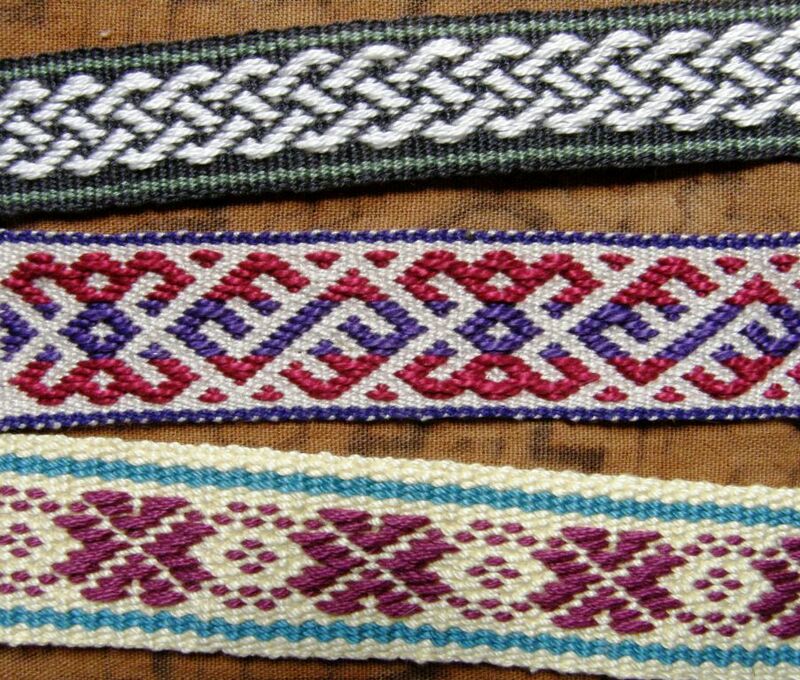 Natasha provided some links to a lovely site with gorgeous Russian bands and a three-holed wooden rigid heddle. I understand the way the two-holed version works and Grace Hatton has done a lovely job of explaining that in her article on WeaveZine, but I am not so sure about this three-holed variety. The design found on the belts from a Russian online store is very close to what I see on the old believers’ belts. The weaver’s name is Svetlana. She lives and teaches weaving and other crafts in Moscow. You can see some pictures taken at the craft exhibition last year. I recently purchased a wooden implement (not sure what the proper name is) from Svetlana that is used for belt weaving and wove my first two belts. It is called “berdo” in Russian. The interest in traditional crafts has grown in Russia too in the last ten years, at least as far as I can tell without being there. If you need anything translated from Russian I can help. You may remember that I attended a weavers’ conference here in Santa Cruz a couple of weeks ago and dedicated a couple of blog posts to it. As a participant from the general public, I got to meet and interact with weavers and other fiber artisans from the highlands and lowlands of various South American countries. Through workshops, videos and presentations we not only learned about the fibers and the techniques used to create the woven pieces, but also about the efforts of researchers, artists and academics to document the processes at the source and educate youngsters in the artisan communities themselves and the general public about these cultural treasures many of which are on the verge of disappearing forever. This made me think of four people I know of who are working or have worked at this very thing and I thought that it would be nice to hear in their own words about their involvement and relationship with the artisans and what they see the future holds. 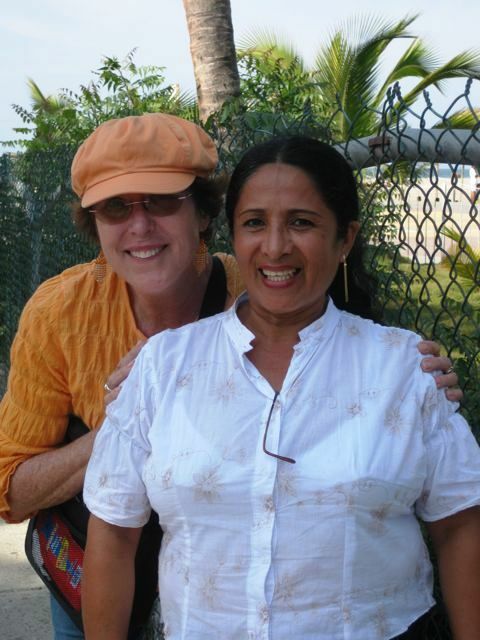 One such person is Dorinda Dutcher, a North American ex-PeaceCorps worker whom I met online and with whom I shared a room at the Tinkuy de Tejedores last year in Peru. Dorinda works out in the field and is out of internet contact much of the time and so I was unable to get in touch with her for this blog post. 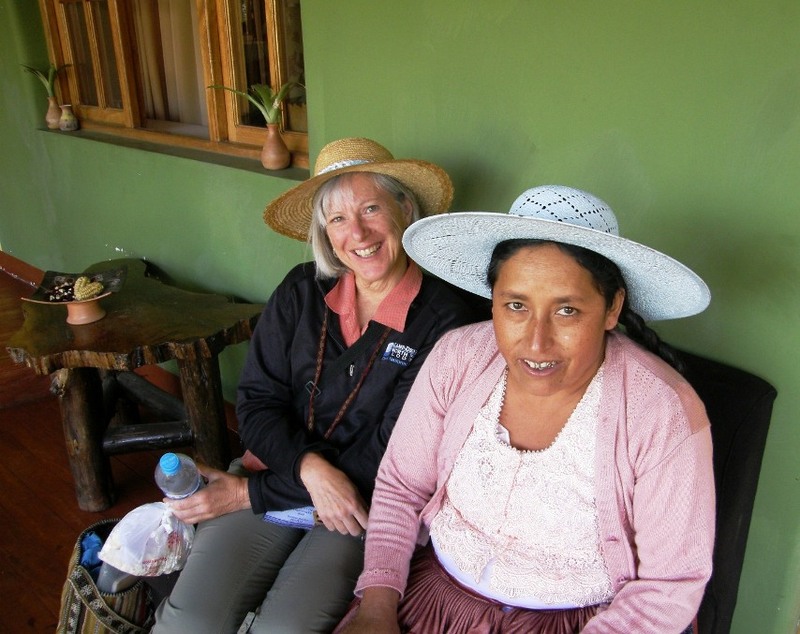 I urge you however, to take a look at her blog and the wonderful programs she has going in the township of Independencia in Cochabamba, Bolivia. Both Dorinda and Maxima, a local weaver who heads one of the weaving associations, were very much moved and influenced by their experience at the tinkuy. You can read all about it and how Dorinda is educating and involving youth in weaving and helping, very slowly but surely, to improve the lives of women in the community in her own words here. 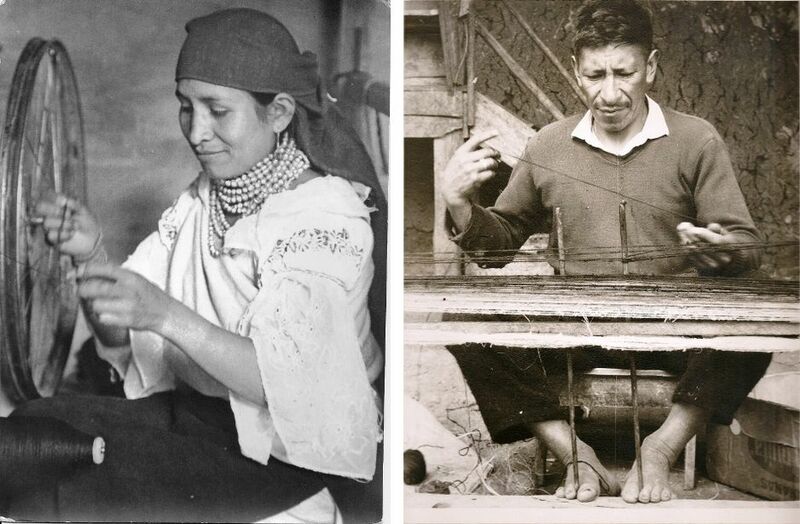 My first contact with this family of weavers was in 1976 when I sat next to an elderly campesino man on one of those colorful open-sided country buses who was carrying a patterned saddlebag known as an alforja labrada. I admired his bag, and I soon found myself up at the home of its weaver, Doña Luz Párraga in the settlement of Zapote documenting their methods in writing and in still photography for preparing cotton, spinning it, and weaving it into alforjas and hammocks. Spinning cotton and weaving on a native vertical loom is a millenarian coastal Ecuadorian artisan tradition that has been transmitted by peasant women from one generation to the next for at least four thousand years. Throughout much of the twentieth century, this craft flourished in the Rocafuerte valley region of central Manabí. 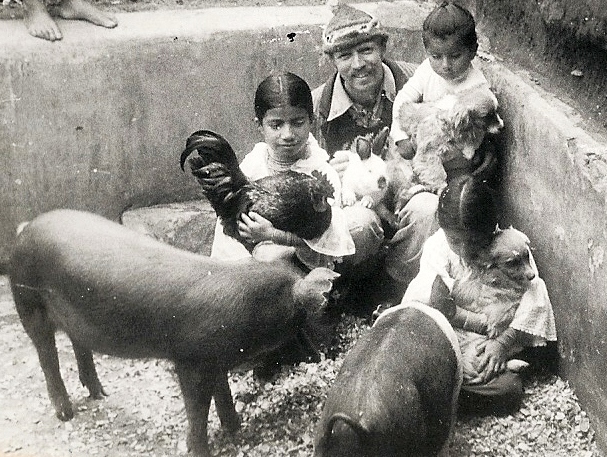 In almost every settlement and small village situated between the city of Portoviejo, the capital of the Province and the city of Rocafuerte rural women spent hours hand-spinning cotton fiber and weaving double-pocket bags or saddlebags (alforjas) and hammocks intended for their own use as well as for that of other peasant families in the area. 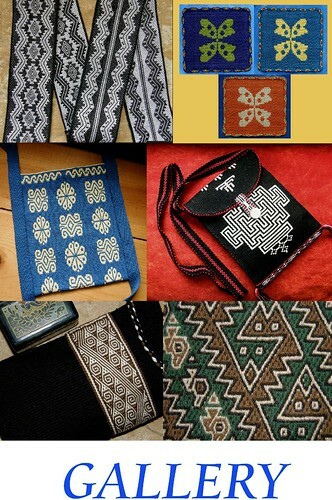 During much of the 20th century, the spinning and weaving of saddlebags and hammocks were part of a female peasant identity and part of their cultural heritage. The finished patterned textile ready to be sewn into a saddlebag. Trini beats the cotton as part of its preparation for spinning. In order to repay Doña Luz and her family for sharing their knowledge and skills with me, I made sure that they had copies of every photograph I took as well as doing some special portrait photography of this family at the request of Doña Luz. 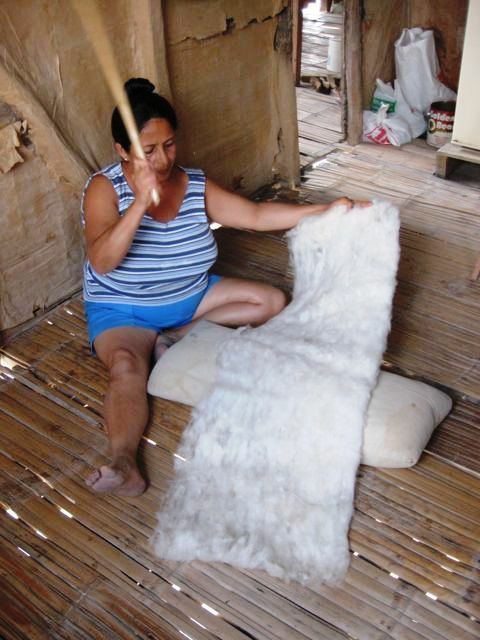 Even though the brief article that I wrote about this millenarian fiber art was published in Spanish in an Ecuadorian anthropological journal, nobody, other than non-Ecuadorian textile specialists took an interest as this activity has been invisible to the members of the dominant society for centuries. I returned to Zapote in 2006, after a hiatus of 30 years only to find that this fiber art was on the verge of disappearing altogether. 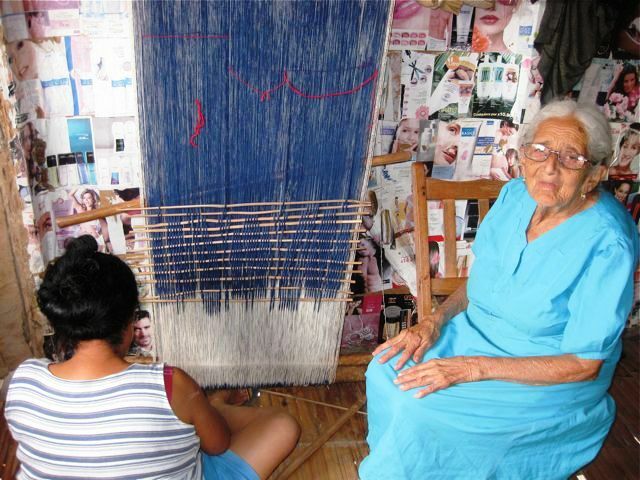 In fact, Trinidad and her sister Mariana were the last active weavers in the entire Province. But there was a problem: neither of Doña Luz’s daughters had learned how to pattern the fancy saddlebags, since the campesinos had stopped using them in preference for plastic bags. In the face of an increasing globalization, the economic and social value of transmitting these skills and knowledge to the next generation has collapsed. Today’s cell phone carrying young ladies want nothing do to with this textile fiber art as it is considered “antiquated” and not suited for “modern times”. They would be embarrassed to be seen spinning or weaving—such is the stigma attached to this former female peasant identity—an identity now tenuously held onto only by their “old fashioned” grandmothers. In 2010, one young lady told Trinidad, as she was trying to recruit her as an apprentice, that she “rather starve” than to earn a living from this artisan activity. My first priority was to insure the transfer of the full inventory of Doña Luz’s knowledge to her daughter, Trinidad, the one most interested in learning. Now in 2011, I report on some recent encouraging signs that indicate that it is not yet totally moribund. These stirrings of life are, I believe, the end result of the steps that I initiated in 2006 to keep this craft alive and to insure that the necessary infrastructure would be in place for it to continue. On my (Laverne’s) visit with this family accompanying Kathleen in 2007, Luz’s granddaughter Catalina would help with de-seeding and teasing the cotton (you can see her there in the background of the first picture). Grandmother, mother and aunt Trini would take care of the spinning and weaving process. On that same trip Catalina took only a very short-lived interest in learning to program the pattern warps but you can see her there in 2010 weaving a hammock on her own while 86-year old Luz sits by. In 2007 when criollo cotton could no longer be purchased anywhere in the region, (cotton used to be a major cash crop of Manabí throughout the major part of the 20th century), I then suggested that they grow their own. Trinidad was able to locate a little old leftover cotton with its seed intact. We both selected the best looking seeds, and she planted them. Since then, she has about 75 viable cotton plants of two varieties of the native South American cotton Gossypium barbadense growing on land that this family owns on the top of the ridge. We also have secured more macanas (the heavy swords or battens used to beat down each successive row of weft thread) from some old ladies in the village who no longer weave. These heavy swords are hand-hewed out of a dense hardwood with the wood of the chonta palm being the preferred material. We also found some old, abandoned fence posts of chonta wood near the town of Chone where this palm grows, just in case we have to fashion new macanas in the future for additional looms and weavers to use. You can’t weave without a macana—it is the essential piece of equipment! But, if despite my efforts, the knowledge of spinning dies out ( as today’s generation of young ladies have no incentive to learn it) I have located an excellent source of natural cotton yarn that takes dyes, both natural and aniline. A new design being woven with suitable industrial spun cotton that Kathleen discovered in the area. 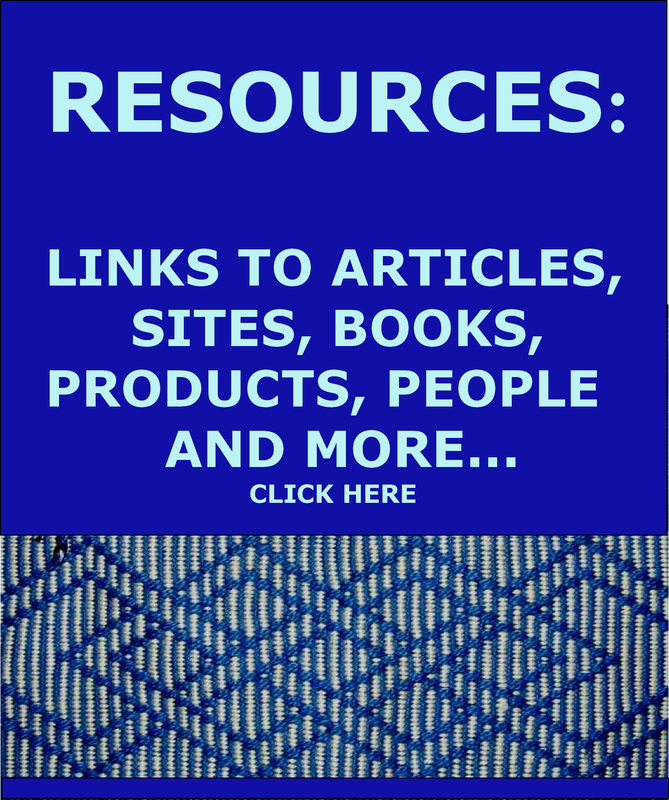 I met Betsy online when I ran into her blog on the Montagnard weavers who are living in North Carolina. We made contact and I organized to go and meet with her and Andrew and the weavers with whom they have been working. On a second occasion, Betsy welcomed me again and I was able to learn the weft twining process called kteh used to finish the ends of blankets and skirts from weavers Ju Nie and Ngach. On this trip I was also able to take part in some of the weaver gatherings that Betsy organizes. 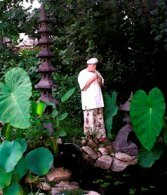 One of my twining classes with Ngach and examples of the beautiful kteh work. 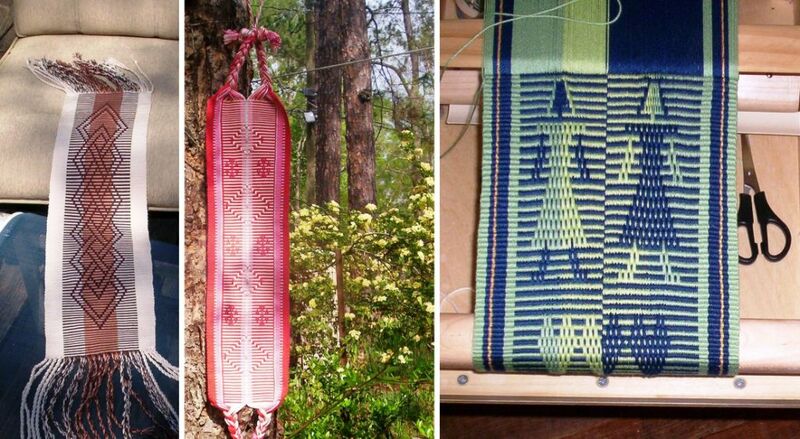 Since 2008 I have been meeting and interviewing Montagnard weavers in Greensboro, NC, in an effort to document their weaving traditions and understand why so little research had been done on these traditions. My background is in the Fine Arts and I found this documentation to be an important segue from the world of painting and art history into a more folk/craft oriented project with a digital element. Recently I have received a grant and great encouragement from the Community Folklife Documentation Institute, a program spawned by the North Carolina Arts Council, North Carolina Folklife Institute, and the Center for Documentary Studies at Duke University. 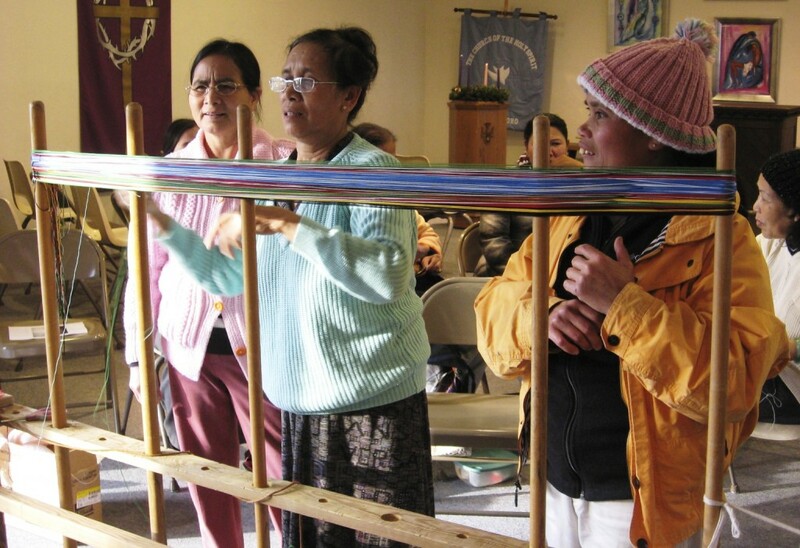 A local church has given space where Betsy can gather the ladies to weave, share skills and socialize. Here she also teaches them the English words for their looms and the weaving process. 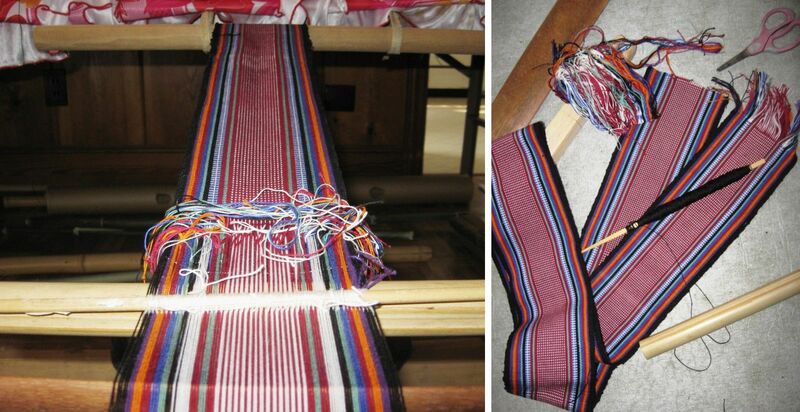 Montagnard weaving and I am eager to share this knowledge with others. I have also partnered with a local Montagnard organization, the United Montagnard Christian Church, in receiving a grant from the United Arts Council of Greater Greensboro. 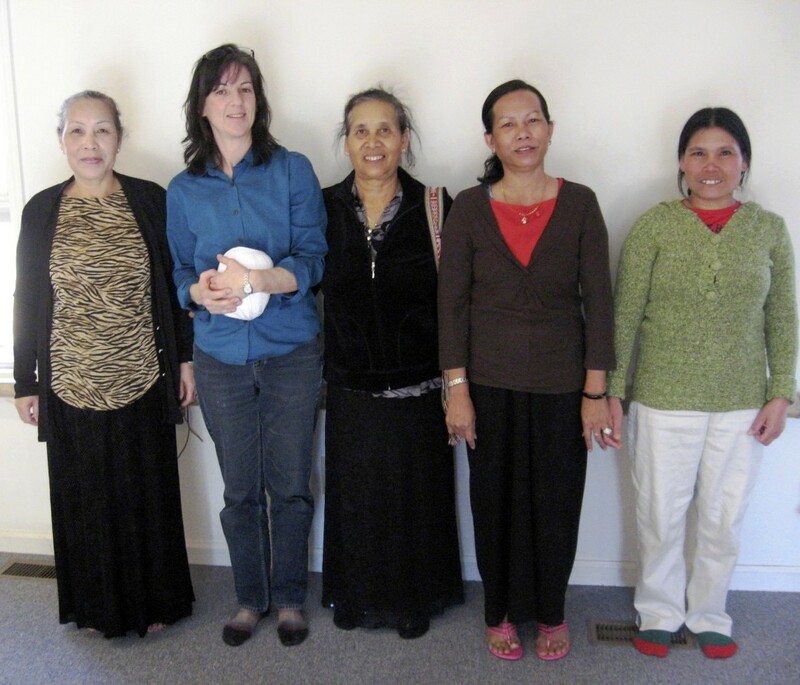 With this grant I have organized women (now known as the Backstrap Weavers of Greensboro) that weave to help them learn some basic English to demonstrate their skills at local events, teach weaving to new students and learn how to market and sell what they weave. We have good following of women coming to our meetings to share weaving knowledge. Most of the women are over the age of 50 and don’t speak English at all or have limited English. Most elderly traditional Montagnard women don’t interact with people outside their kinship group or church circle because they don’t drive, can’t read, or do not have a job. I found a certain level of low self esteem at first (because of the language barrier) but now I see these women not only enjoying themselves during our weaving time but interacting with people from different language groups (refugees from the Central Highlands speak five or six different languages) and other ethnicities. They have also come to trust me and to tell me what they love best of their culture. Ju and Khin, both of the Jarai tribe, meet at the church to make a new warp. One of my frustrations within the last year or so is a small turnover in attendees. Some of the women can’t come regularly because they care for grand children, have old injuries from working at textile mills, or poor vision. And there is the continual concern for sustainable income or funding for the project. Many of the women do not understand what a grant is or how it works! Despite these frustrations I have built a bond with what seems to be the last few practicing weavers in Greensboro. I teach them English, they cook me hablang, or cassava leaf soup. They teach me the words for their loom parts and I teach them how to teach others to weave. They are weaving with new supplies and beginning to make smaller purse type products to sell. 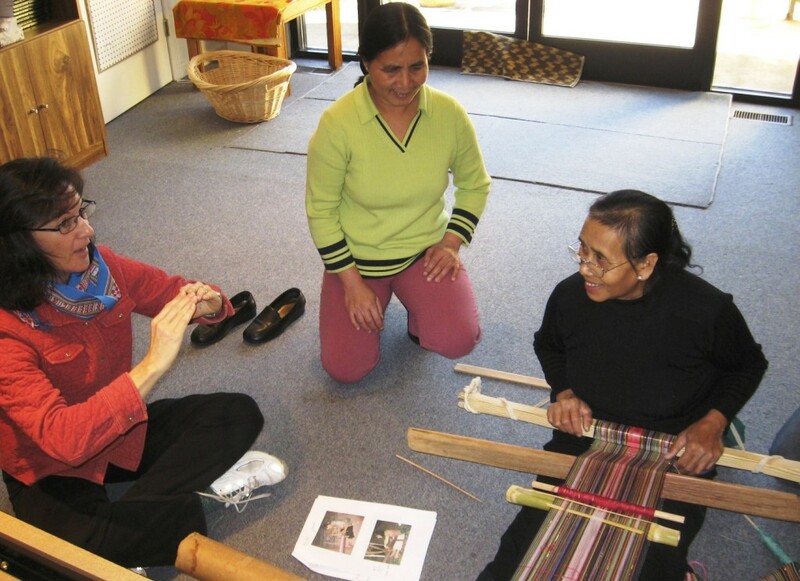 Betsy helps Ju an other weavers develop a way to teach their backstrap weaving art to others. This is Betsy’s first completed piece from her weekly classes with Ju. 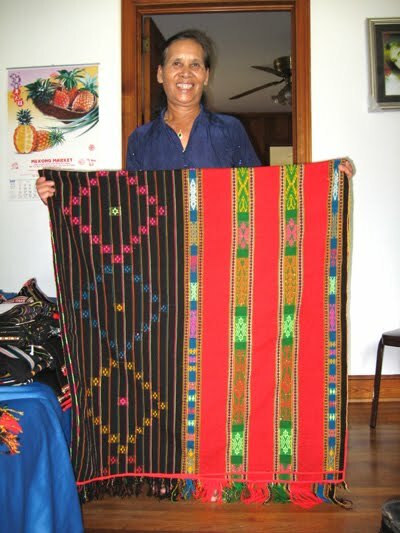 Bunong weaver Tep showing one of her newly woven pieces. More aggressive fundraising tactics and creating an on-line market/gallery on our local arts websites. I also will be widening my reach to Nepali speaking Bhutanese refugees, who also use backstrap looms. Please follow what we are doing on our blog. I never had the pleasure of meeting Dennis Penley. 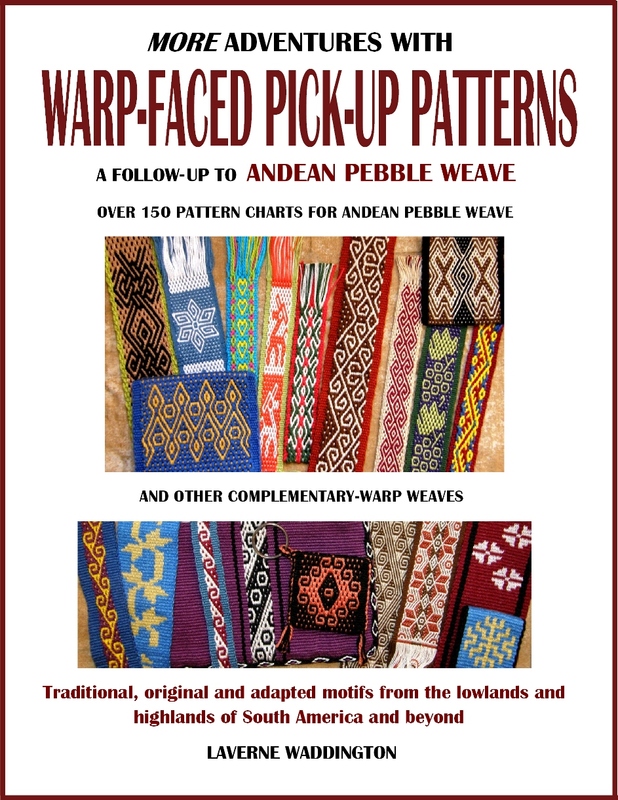 I bought the book he wrote on the ikat shawls or paños of Gualaceo, Ecuador on a visit there in 2005 knowing nothing about its author and the fascinating life he had led. I have, however, been lucky to have become acquainted with Phil Willett, once again, on line, to whom Dennis Penley was a good friend and weaving mentor. Mr Penley passed away the year after I bought his book and Phil wrote a short biography to accompany an exhibit of his collected textiles made as a tribute to him. I won’t caption the photos, all of which (except the first in color) I understand were taken in Ecuador. Dennis Penley, a life time of hand weaving enthusiasm. From his early beginnings creating elaborate costumes for himself and the Arabian horses his family raised and trained, Dennis was a born textile enthusiast. He taught himself to weave as a teenager and utilized that interest to befriend many people through his life. After high school he joined the Peace Corps and worked within the Ministry of Agriculture of Ecuador. 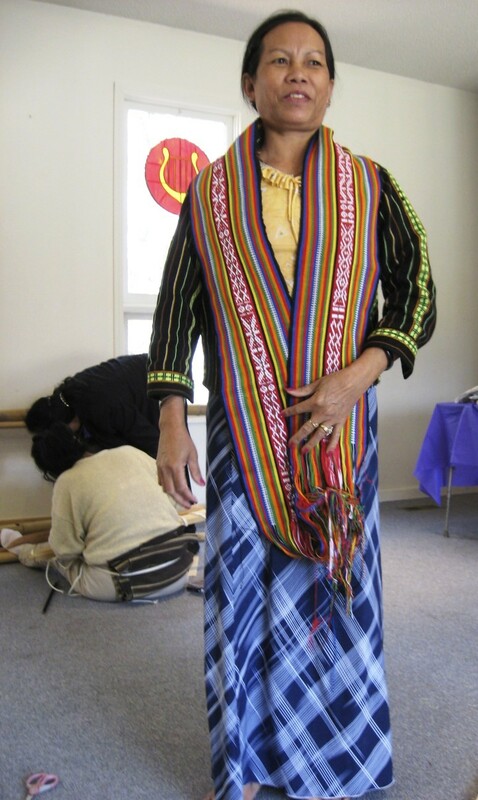 Part of his job was researching the indigenous peoples weaving traditions. 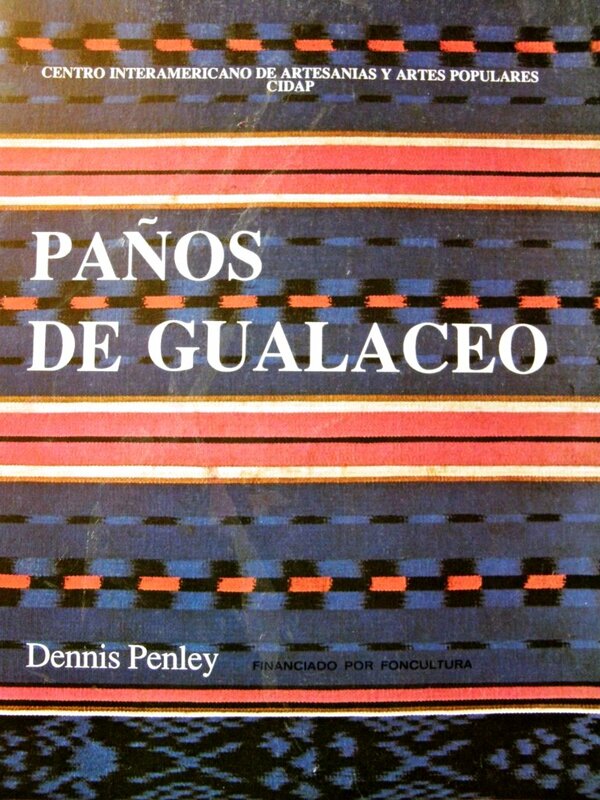 Following his Peace Corps service he stayed in Ecuador to research and write a bilingual book on the shawls of Gualaceo. 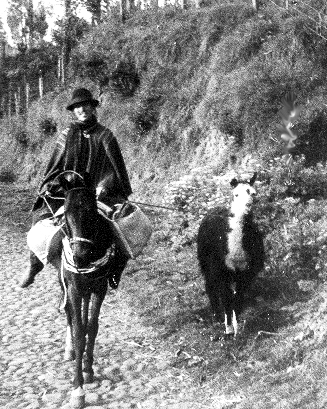 He lived and worked among the indigenous mountain weavers, with a horse to travel by and a llama to spin wool from while it also carried extra gear. When he returned to the USA Dennis received an honorary bachelor’s degree from San Francisco State for his work in Ecuador. 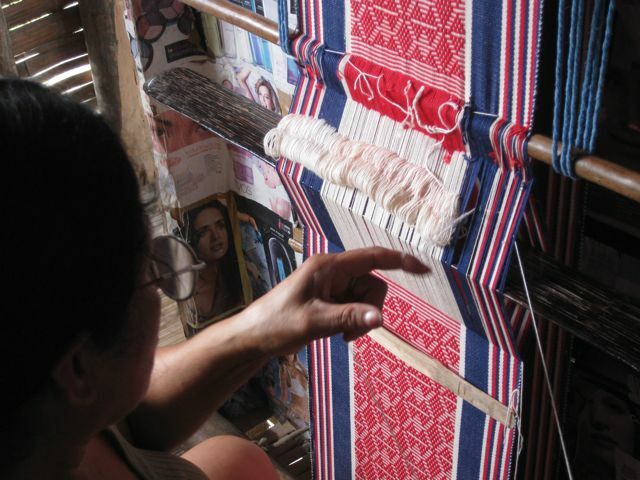 Dennis not only photo documented the techniques of the weavers, he learned them by hand using a back-strap loom. With all this weaving knowledge he had hopes, when young, of a lifetime of hand weaving. Based out of California he produced custom hand-woven yardage for designers, blankets and home accents. All this was accomplished on a Swedish barn loom. His dream would not prove to be financially viable. 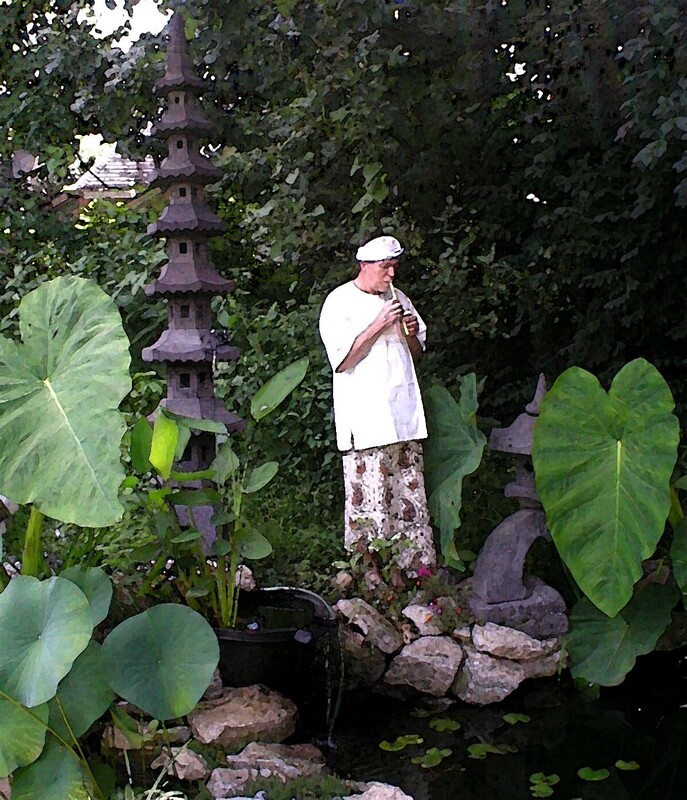 Dennis would, through his working career, excel and profit at many other endeavors. He was a master cabinetmaker and historic architecture restorer. He worked for many years for the city of Lexington, his final position as a code enforcement officer. 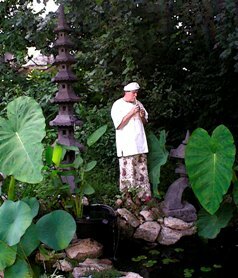 Dennis’ studies of non-western cultures, philosophy and textiles would be a passion for his entire life. 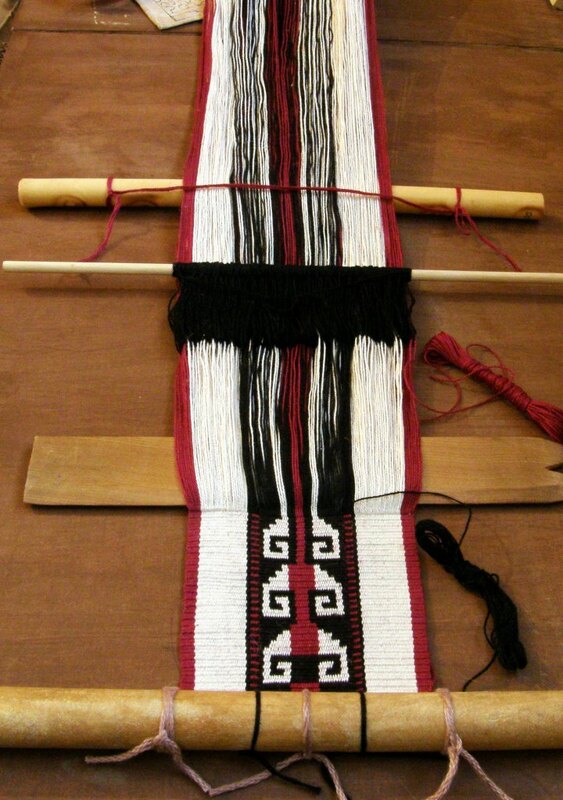 He first became intrigued with ikat weaving in South America. He would later research its use throughout many cultures. After years of studying the textile traditions of Southeast Asia and Indonesia he traveled twice to the region to see the artisans and collect textiles. The textiles within this collection are a testament to an inquisitive mind that had a tremendous respect not only for the craft but also the people who created them. They are works of art and expressions of cultural identity and diversity. 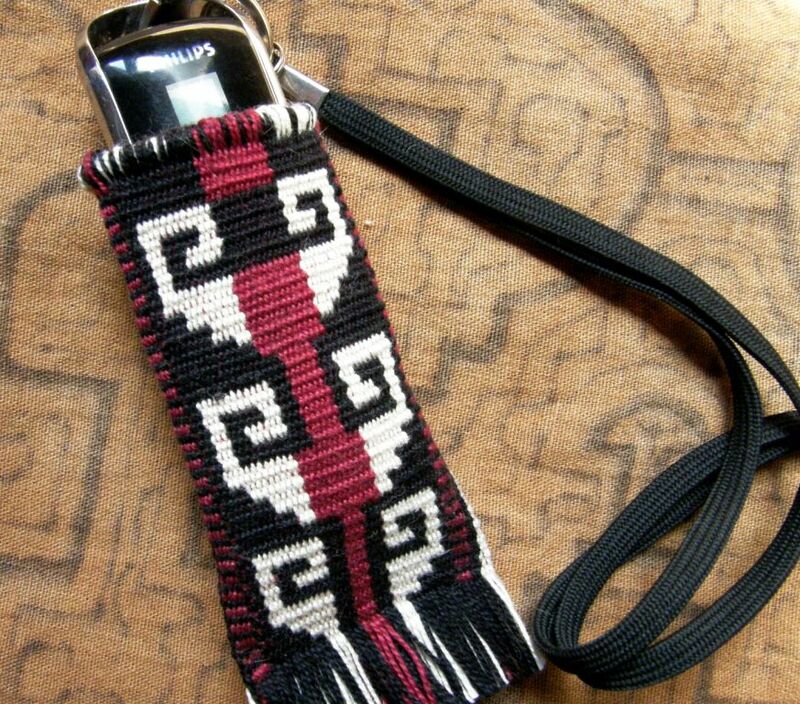 Marsha has been making all kinds of wonderful things with simple warp floats. The knot design on the left is charted here. Bobbie is making a bag with pebble weave designs. Here we see the wide front and back panel and the side. Popsicletote is weaving with her handspun wool/silk blend. The hairiness is making life a little difficult but she is adapting and getting on with it. Her designs are pebble weave. Tracy has just warped up her own handspun wool. Here you can see it curled up at rest and then tensioned on the loom bars. 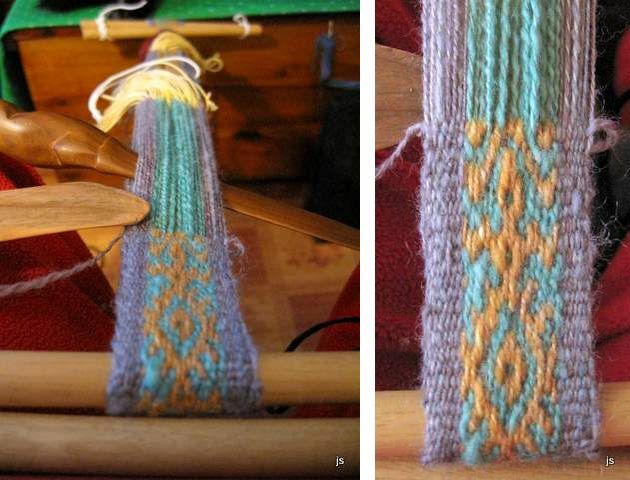 Another ‘waver’ has joined in the warp-faced fun (Waver= user of Gilmore Wave loom). 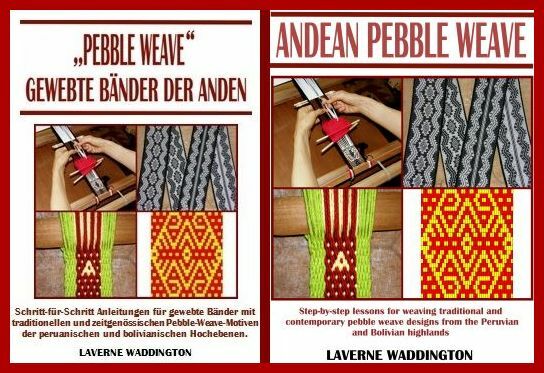 That’s Michele’s pebble weave band on the left with one of my designs from my Andean Pebble Weave e-book. Popsicletote tried sock yarn for making a band and it turned out beautifully! 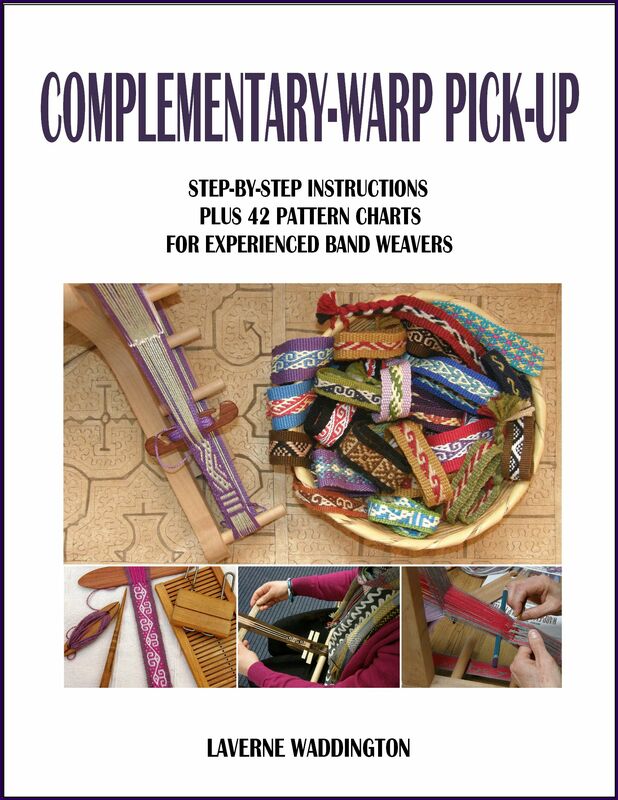 These are simple warp float bands by popsicletote and Sharon and a double weave band by Sylvie. I LOVE all these different wool warps showing up…hand spun, re spun commercial yarn…all working differently and giving a variety of results. How lucky we are to have all these folks experimenting and creating and sharing with us. I am learning so much! Thank you for all you do to bring the backstrap weavers of the world closer together. I too have met Dorinda and found her dedication to the weavers in the Highlands of Bolivia to be so selfless. Congratulations to you on the publication of your book in German. And as always thanks for all you do to share backstrap weaving and honor the weavers of the world. 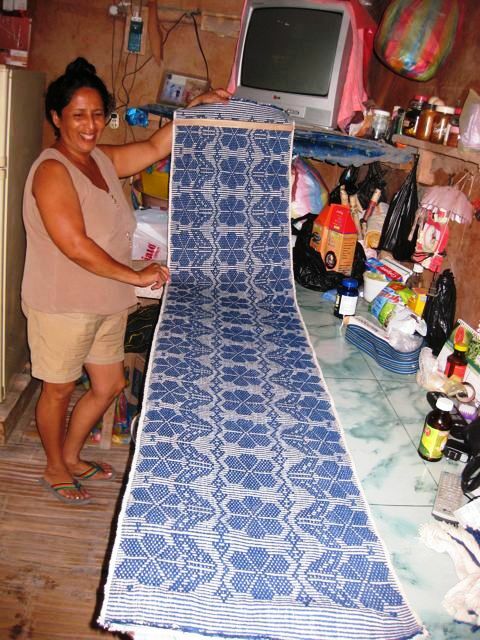 My girlfriend and I are looking forward to trying some backstrap weaving here in Mexico. Your blog has been an inspiration. Keep up your interesting research. Thank you! Good luck with your weaving adventures in Mexico. I hope that you will tell me all about it later.